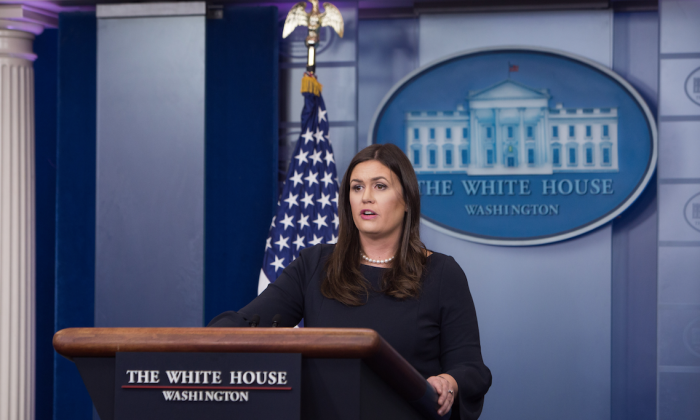 WASHINGTON—White House Press Secretary Sarah Sanders on Monday, Sept. 25, denied that the United States had declared war on North Korea. “We’ve not declared war on North Korea. And frankly, the suggestion of that is absurd,” Sanders said. North Korea’s foreign minister, Ri Yong Ho, had said earlier in the day that a tweet by President Donald Trump over the weekend was a declaration of war. Ri also said that the communist dictatorship intends to shoot down U.S. bombers in international airspace. Ri’s comments came just days after he said in his U.N. speech that the North’s nuclear weapons program is almost completed. Last week Trump spoke in his speech at the U.N. against North Korea’s missile program, calling on other nations to stand up against it. “North Korea’s reckless pursuit of nuclear weapons and ballistic missiles threatens the entire world with unthinkable loss of human life,” Trump said. He said that while the United States has “great strength and patience” it could “totally destroy North Korea” if forced to defend itself or its allies. North Korea has fired two ballistic missiles over Japanese airspace into the Pacific Ocean. Earlier this month, the regime also conducted an underground nuclear test. Ri in his speech said that North Korea successfully completed a test of a nuclear weapon that fits on the warhead of an intercontinental ballistic missile (ICBM). “The ICBM marked with the sacred name of the DPRK flew over the universe above the endless blue sky, the warhead of our rocket left its trace on the blue waves of the Pacific Ocean and the tremendous explosion and vibration of the hydrogen bomb were recorded by this planet,” Ri said in an apparent reference to an ICBM test earlier this year where the missile left the atmosphere, and its nuclear test earlier this month. Experts say that the ICBM was destroyed when it re-entered the atmosphere. On Sept. 23, the United States and South Korea conducted military exercises in international airspace over waters east of North Korea. 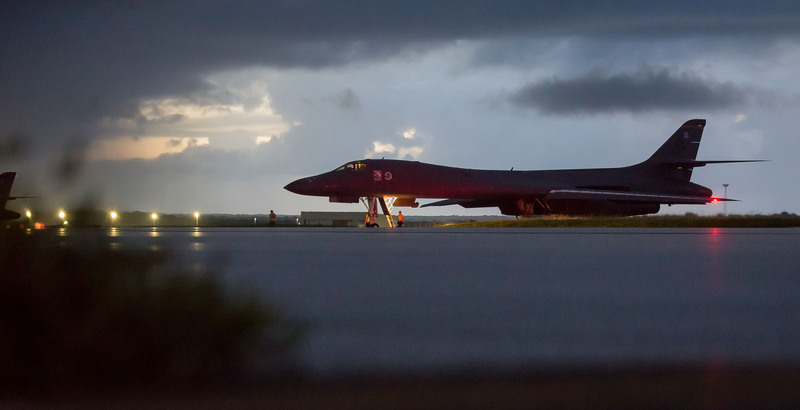 U.S. Air Force B-1B Lancer bombers were accompanied by fighter jets in the exercises. The Pentagon said the flight was the farthest north of the demilitarized zone separating North and South Korea that any U.S. fighter jet or bomber has flown in the 21st century. “That operation was conducted in international airspace, over international waters, so we have the right to fly, sail, and operate where legally permissible around the globe,” Pentagon spokesman Colonel Robert Manning said Sept. 25. “It’s never appropriate for a country to shoot down another country’s aircraft when it’s over international waters. Our goal is still the same: We continue to seek the peaceful denuclearization of the Korean Peninsula—that’s our focus—doing that through both the most maximum economic and diplomatic pressures as possible at this point,” Sanders said. Earlier this month, the Security Council imposed new sanctions on North Korea in response to its latest nuclear test. The sanctions prohibit the sale of natural gas to the North and limits the amount of crude and refined oil that can be sold to reclusive country. Separate from the resolution, China’s Central Bank instructed Chinese banks to stop providing financing to North Korea. 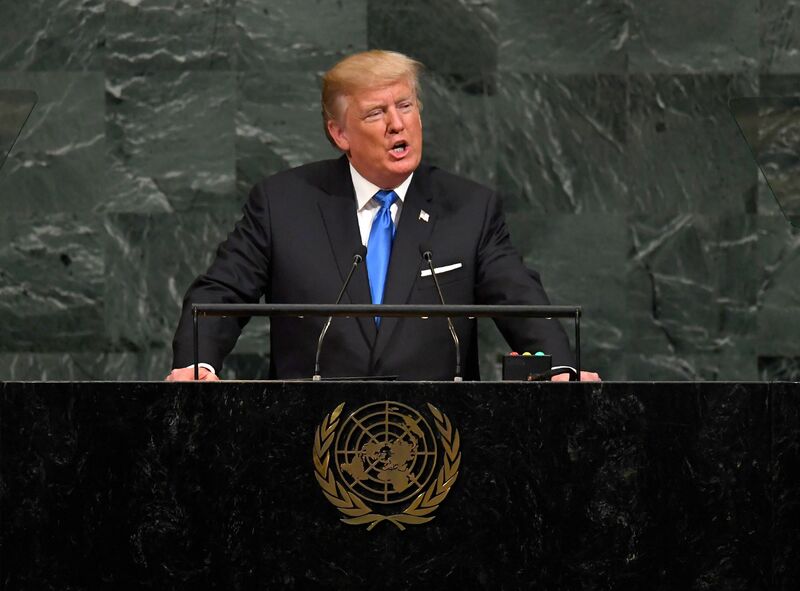 In Trump’s speech to the U.N. on Sept. 19 he called out a number of regimes, including North Korea, Iran, Venezuela, and Cuba. He called out communism and socialism as being responsible for the economic and political crises, as well as the suppression of the people, in Cuba and Venezuela. “From the Soviet Union to Cuba to Venezuela, wherever true socialism or communism has been adopted, it has delivered anguish and devastation and failure,” Trump said. Ri said that North Korea stands with Cuba and Venezuela in defense of socialism.